Wind power is recently in the spotlight as an eco-friendly source of energy. As such, it is essential that it be adapted to severe environmental conditions. The downwind turbines developed by Hitachi features both the ability to efficiently capture winds that blow upward in mountainous areas where wind turbines are installed and to stand up to the powerful gust of Japan's summer typhoons, the extreme lightning of its winter, and other aspects of the country's severe natural environment. Hitachi offers solutions - with a full range of services, from the Long Term Service Agreement for ensuring stable facility operation and predictive diagnostics that use digital technologies to anticipate faults to financing and consulting - to meet the needs of customers who newly enter the power generation industry by solving issues through collaborative creation and creating new values. In response to the increasing introduction of renewable energy and the full liberalization of the electrical retail business, companies making plans to enter the field of power generation or to expand their current operations are on the rise. In Japan, this requires the development, design, manufacturing, and sales of wind turbines adapted to Japan's severe environment by having the durability to withstand typhoons, lightning, and other threats from nature. It also requires support for improving the efficiency of maintenance and other such business operations. From design and construction to operation and long term maintenance, Hitachi provides total support for all phases of a wind energy project. Through Hitachi Wind Power Ltd., the joint investment venture by Hitachi and Hitachi Capital Corporation, Hitachi is building expertise as a wind power utility while engaging in collaborative creation with customers by providing energy solutions that include special purpose company and financing. The analysis of large amounts of data collected from facility equipment and the application of predictive diagnostics, a technology that finds signs of impending faults, have made it possible to provide an efficient maintenance service through such measures as advance arrangements for replacement parts and collective response during inspections. In 2015, the worldwide capacity of renewable energy facilities exceeded that of coal-fired power. *1 With the aim of creating a low-carbon society, in July 2012, Japan put into effect the feed-in tariff scheme for renewable energy, stimulating the construction of solar and wind farms. In 2016, the full liberalization of the electrical retail business resulted in an increasing number of companies planning either to enter the power generation field or to expand their business. These market conditions engendered a need for the development, design, manufacturing, and sales of wind turbines optimized for Japan's environmental conditions. Utilities considering entering the field of wind power also sought assistance in the streamlining of maintenance and other such business operations. Wind turbines in Japan must be adapted to geographical conditions dictated by a lack of flat land and a general lack of space. Such adaptations include the ability to maximally exploit winds that blow up along the slopes of hills when facilities are installed in mountainous terrain, as well as the durability to withstand a variety of severe natural phenomenon, including high and cyclonic offshore waves, typhoons, and lightning. Hitachi's downwind turbines are designed to withstand such harsh conditions. Hitachi's downwind turbines have blades that rotate with the wind. When viewed from the windward direction, this surface is inclined downward, allowing it to efficiently catch wind blowing up from the feet of mountainous and hills for use in power generation. One of the features of this wind turbines is that in the case of loss of external power due to a blackout, the blade uses the force of the wind like a "weather vane" to change its orientation, enabling it to protect itself from powerful storm winds. As the utilization of this "weather vane effect" reduces wind load, it is possible to decrease the amount of materials needed for foundation work. Downwind turbines having this advantage are in commercial operation throughout Japan. One example of this is the wind farm operated by "Aoyama-Kogen Wind Farm Co.,Ltd." located in the Aoyama Plateau, a part of the Nunobiki Mountains, a mountainous area extending from the eastern part of Iga City to the west of Tsu City, in Mie Prefecture. This facility has 40 of these downwind turbines in operation. The output is 80 MW, the highest in Japan (as of February 2018). The amount of electrical power that can be generated is equivalent to the annual consumption of about 44,000 ordinary households. In addition, Hitachi's 5.2 MW wind turbine, HTW5.2-127, has obtained "Wind Turbine Class T" certification, a standard for wind turbines certifying that they can withstand exceedingly strong winds of speeds at an extreme 57 m/s. *2 Japan also has a phenomenon called "winter lightning," which has hundreds of times more energy than the lightning that occurs in summer. The Hitachi's wind turbines are designed with lightning resistance that can handle 95% of winter lightning. Defined in the industrial standard JIS C1400-1 for wind power turbines design requirements, this takes into account safety with respect to Japan's severe wind characteristics and was added as a JIS revision in 2017 (Source: Ministry of Economy, Trade and Industry). The construction of wind farms requires a comprehensive approach that covers a broad range of needs, from environmental assessments to the procurement of construction funds. This may include ascertaining wind conditions or how winds blow over the planned construction site, along with construction planning that takes into consideration the effects on the surrounding environment and local residents and the provision of support for interconnecting wind farms with power transmission systems. Through Hitachi Wind Power Ltd., established jointly with Hitachi Capital Corporation, Hitachi is building expertise as a wind power operator while going forward with collaborative creation with customers by providing energy solutions that include power plant management, electric power sales contracts, grid interconnection deliberations, special purpose company, and financing. In addition to the above, in response to the setting of fixed purchase prices for 20 years in accordance with Japan's feed-in tariff scheme and the systemized implementation of regular inspections for power generation systems, Hitachi is also providing support in the form of Long Term Service Agreement with a view toward meeting the needs of customers asking for stable operation over the long term. One case of collaborative creation achieved by combining total solutions such as these with a customer's experience in the energy supply business is that of the Eneseed Kitakyushu Wind Farm established jointly by Eneseed, Kyushu's Saibu Gas Group, and Hitachi Wind Power, which was established by Hitachi Capital and Hitachi. For this wind energy project, Hitachi took on planning and construction to operation and maintenance. Financing was also provided by Hitachi in cooperation with Hitachi Capital. Toshio Yamamoto, executive officer and general manager of power business planning department of Saibu Gas, gave the reason for collaborative creation as follows: "Saibu Gas aspires to be a total energy services company. In addition to the natural gas business, which is currently the main target of our efforts, the growth and expansion of the renewable energy business is essential. We considered that utilizing Hitachi's technology, know-how, and wide-area maintenance system, along with Saibu Gas's Kyushu business infrastructure, would lead to the stabilization of the wind power business." 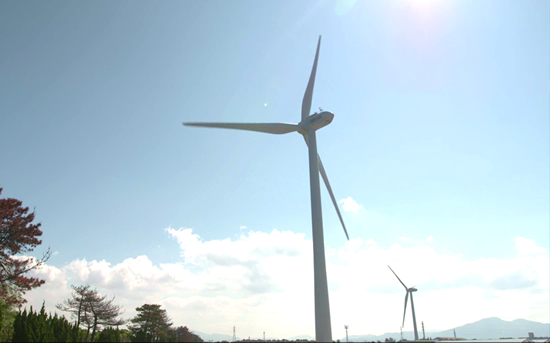 For the next 20 years, the Eneseed Kitakyushu Wind Farm will supply an amount of electrical power equivalent to the annual power consumption of 2,500 ordinary households. For customers that operate such infrastructure facilities as power plants, unexpected and unplanned facility shutdowns can lead to big losses. Predictive diagnostics is a technology that is effective in both implementing continuous and stable facility operation and in reducing maintenance costs. Hitachi has brought together its OT (Operational Technology) expertise, which is a product of our extensive experience in maintenance services, and its IT, so as to provide a predictive diagnostics solution that prevents unplanned facility shutdowns. The diagnostics engine used in predictive diagnostics applies proprietary machine learning and is one of the main architectures that makes up the Lumada IoT platform. Using proprietary data mining technology, this predictive diagnostics solution can also infer causes by collecting large amounts of operational data from sensors incorporated into the equipment of wind turbines and other power generation facilities, analyzing such with automated diagnostics technology, and detecting signs of failure. It also makes use of accumulated data on historical events. Another of its features is a user-friendly interface that contributes to the standardization of facility maintenance by removing the need to rely on the personal experience and instincts of expert engineers to determine faults. Through the use of predictive diagnostics, causes can be investigated before faults occur and inspections can be carried out at suitable times to reduce maintenance costs and prevent major accidents, such as damage to facilities and extended shutdowns. In other words, predictive diagnostics makes it possible to take an approach that anticipates future faults today, whereas, in the past, these occurred unexpectedly. Hitachi provides a total package for highly reliable wind turbines that are adaptable to Japan's severe natural environment, from their design, manufacturing, and construction to Long Term Service Agreement covering predictive diagnostics that utilize facility operation expertise and IoT. Hitachi is also putting effort into the development of maintenance and inspection personnel possessing advanced skills and knowledge through "the Hitachi Wind Turbine Maintenance Training Center", a facility equipped with nacelle hubs and other special practice equipment. By providing total solutions for such facilities as wind turbines that are founded on superior technologies and knowledge, Hitachi will continue to contribute to the achievement of a low-carbon society through collaborative creation with customers that finds solutions to issues and creates new value. Solutions By: Power Business Unit, Hitachi, Ltd.